It is getting to be a pain with the way GPBikes keeps laps and times. I am sorry if some feel they are done wrongly but it is a bloody mess until Piboso fixes this MAJOR BUG!!! 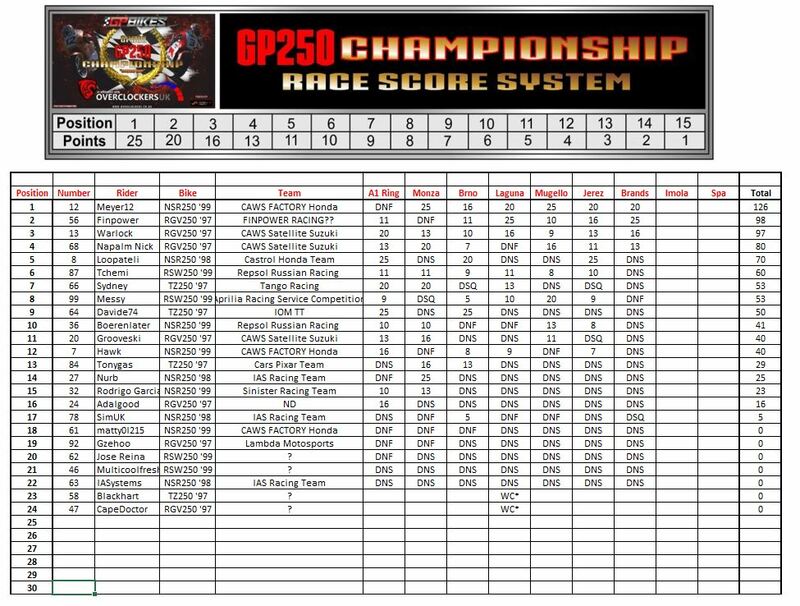 Hopefully we can get the TEAM standings too hehehehehahahahaha yep I know busy times lol. It would be time again. Could one provide a server with imola? Would like to drive a few rounds online. Ps: another week past and the table is still not the latest stand.finde it simply a pity. I know I'm already annoying again. But you could not disable the password in free training? Maybe other drivers want to train this course. 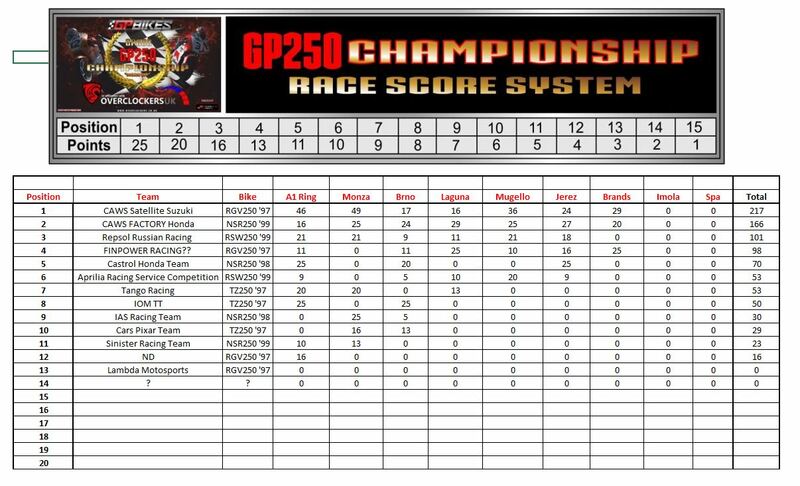 Here is the updated standings plus standings for teams, please correct me if you see anything wrong, i have taken DD's points from previous races and then the last two races is from the standings, no changes in that. Also please correct me if some of the teams are wrong. Update coming tomorrow, Matty discovered a minor mistake. I got Boeren and Matty's results from Jerez mixed up. Thanks guys, found a little mistake in my excel file that resulted in the wrong results. Great work Meyer thanks mate! I have copied it up to the first post for ease of finding on DDs behalf. Yes great results for the Satellite Team! I wonder what the prize is??? If your lucky and have plenty of money behind you, you get promoted to the "CAWS Factory Team".